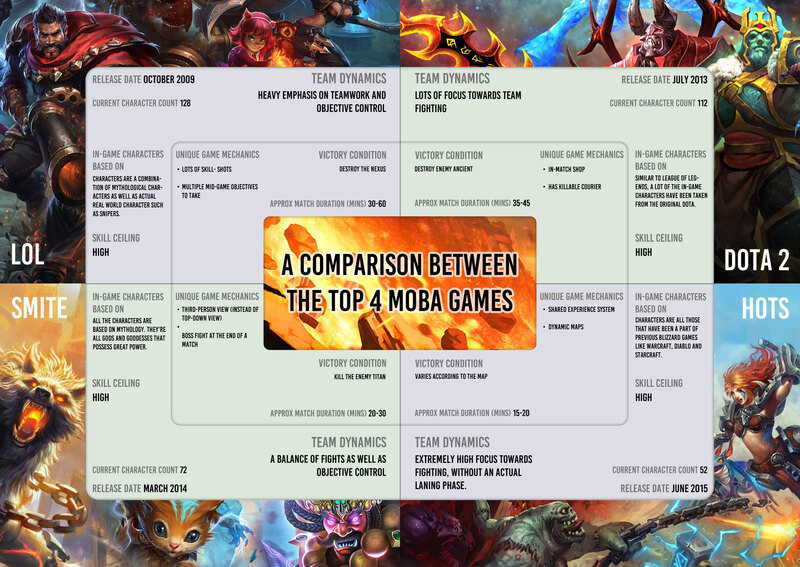 A helpful summary of the differences between the top 4 MOBA games currently in existence. To view the full image, please click HERE. If you're anything like our writer, Skyrus, you're probably obsessed with MOBA games (in a good way). However, it can be really hard to discern the differences that each of the top 4 MOBA games has to offer, and this can be especially confusing if you're a new player who is looking into trying out a suitable MOBA game for the very first time. Thus, with our graphics designer's help, Skyrus has helpfully drafted up this amazing (and concise) summary of the article he wrote back in January entitled "Comparison Between The Top 4 MOBA Games". If you haven't checked it out, be sure to do so... like right now! Rest assured that it'll be worth every minute of your time.